Sammy's Woodfired Pizza Kit - San Diego Dining Dish! So a couple of weeks ago, I did a Valentine's Day Roundup that included a bit about these darling pizza kits being assembled and sold by Sammy's Woodfired Pizza. Last night, we had a chance to try one, and I have to say, it wa a hit! 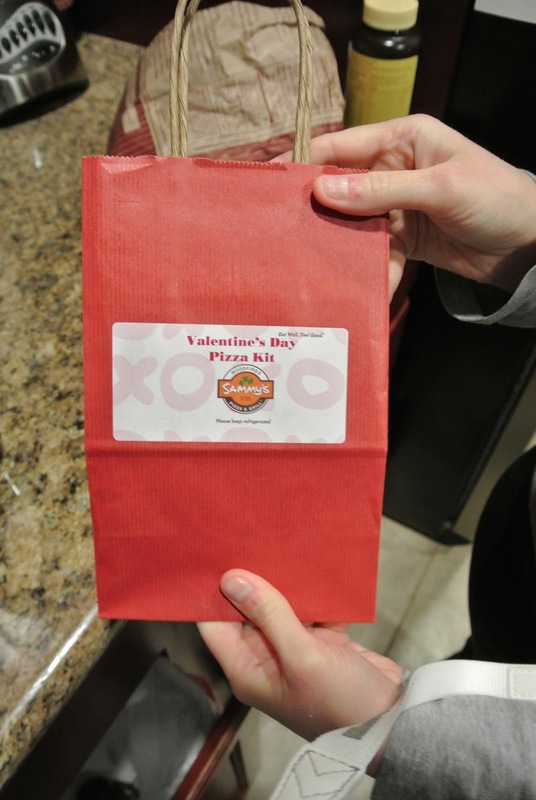 The kits are sold in the restaurants, and come assembled in this cute little bag, perfect for Valentine's Day, or for someone that just had a new baby, or a reward for a good report card. All ingredients plus instructions are included, and the ingredients are portioned just perfectly to ensure a tasty product. One simply preheats the oven, rolls out the dough (into a heart shape, which was difficult for us! ), and spreads on the toppings like so. Pepperoni can be added for an extra $1, but we opted to do the margherita style. Ten minutes late, voila! A semi-heart-shaped pizza for dinner! We served with a green salad, and it was wonderful! Definitely a nice treat to have at home when you feel like a nice pizza but don't want to go to the trouble of going out. This would make a very nice dinner for a couple with a baby on Valentine's. The kits start at $6.50, and are available at all Sammy's locations.